This beer pours a clear true copper color with a fairly rich looking off white head. There also seems to be a good amount of carbonation in this brew. Sweet caramel malts on the nose with a slight hop aroma and some interesting earthy background notes. This a very pleasant tasting beer but there is not much more to this beer than any other all malt lager. Don’t get me wrong it’s not bad but it doesn’t seem to have that richer caramel malt flavors that I have come to expect in an Oktoberfest. The taste starts with a pleasant but very light caramel malt sweetness then a nice effervescence and a very nice dry hop finish with an almost sweet final finish. I really can’t find anything wrong with this beer. This is a good beer but it’s not one of those Oktoberfest that you can mistake for an ale; this is a definitely at lager. This beer does not have those rich caramel malt flavors of an Oktoberfest. It has warmed up to 67 degrees and it is still a very good beer. This beer is picking up a slight unpleasantness on the backend of the swallow. It’s not bad but it certainly isn’t as good as it was. All and all this is a pretty good beer. 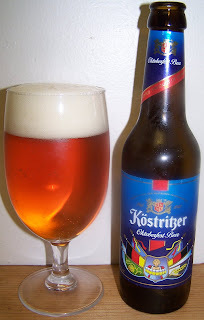 Nothing outstanding; an above average lager but not a very good Oktoberfest. I don’t think I will be buying this again and I really can’t recommend it; although it is a drinkable beer. So for an overall all malt lager it’s pretty good like a B-, for an Oktoberfest, not so much, C-. This was a little disappointing for a German Brewery.